DNC Vice Chair Michael Blake to Headline PA Dems Keystone Dinner: The party is slated to endorse two candidates for Superior Court on Saturday. SD37: Iovino, Raja Face Off In Lone Debate: For the most part the candidates echoed their party’s positions, while occasionally finding some common ground. Williams Joins Race for Philadelphia Mayor: The state Senator is the third candidate to announce his intentions for the Democratic nomination. Democratic Ad Maker Stops By Biden’s Childhood Home: Politico first reported that Mark Putnam, a Democratic campaign commercial producer with ties to former VP Joe Biden stopped by Biden’s early childhood home in Scranton. 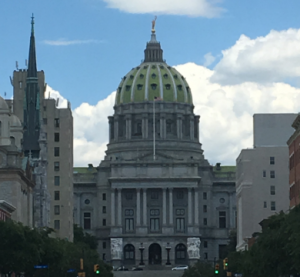 Decision Desk HQ Breaks Down SD37: The article stresses the importance of the closely watched special election and the possible implications it may have on a number of 2020 state Senate races in swing districts. Philly Clout: Did ‘artificial intelligence’ spot petition fakes in City Council races? A judge will make the call. Pottstown Mercury: Leach renews push to legalize pot in Pa.
Inquirer Editorial Board: Encampment closure was a success. It still wasn’t enough. Cassandra Stubbs: Can prosecutors dismiss jurors who agree with the O.J. Simpson verdict?